← There’s (Already) An App For That. Just Make Your’s Better! Enough with the Leaks! Drop The iPad 3 Already! Is it real? Will the world have the iPad 3 soon? A little over a year ago, I got my first iPad. Less than 35 days after I did, Apple released the iPad 2. Needless to say, my acquisition fell outside of the 30 day window in which Apple permitted iPad owners to exchange their iPad and upgrade to the iPad 2. I wasn’t about to shell out any money for what I thought (at the time) were minor upgrades. I had fallen for Apple’s chicanery in the past, and I wasn’t about to be parted with my money for a few bells and whistles. Sure, there’s a better display, and two cameras, and a faster processor, but what does that really mean? It wasn’t until a few months ago, that I actually used an iPad 2 for the first time. Now I look upon my iPad with utter disgust. How could I have been living like such a…savage…for so long? So, it is with much anticipation that await the release the iPad 3. And each new leak only increases that anticipation. For months, there has been unbridled speculation about what new features the iPad 3 would possess. And recently, there have been credible ‘leaks’ of some of the component parts of the upcoming Apple tablet. Here’s a short summary for you cave dwellers. 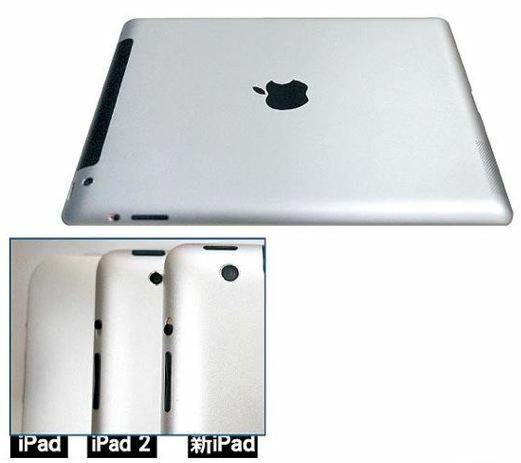 Last week, Mashable released photos of what purports to be the outer casing for the iPad 3. The images, which came from a Chinese blog, Apple Daily, are contained in a gallery which show the inside and outside of the casing. 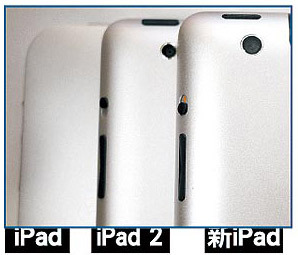 In addition, Apple Daily included a comparison of the three iPads, showing the similarities and differences of one section of the iPad. The case is rumored to be slightly larger than the iPad 2, to accommodate a larger battery, to support a more powerful processor and the LTE 4G radio. iPad 3, I must have thee! The iPad 3 is rumored to have a 2048×1536 retina display. This rumor was apparently confirmed by MacRumors (how appropriate) last week, when they posted (what appears to be) photographs of the new ultra-high resolution retina display, which they claim to have examined under a microscope. What does a display with twice the pixels of the current iPad mean to regular folks? Think HD on your iPad. Images will be incredible sharp and you’ll see details that you weren’t even aware were there on regular displays. 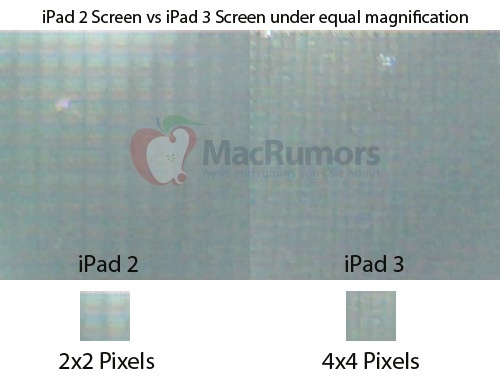 MacRumors side-by-side microscopic comparisons of the iPad displays. The size and configuration of the back casing also appears to fuel speculation that there will be an 8 megapixel camera (the same camera on the iPhone 4S) on the new iPad. An 8 megapixel camera on the iPad 3 will mean higher quality photographs, rivaling that of professional cameras. (Not really – but I wanted to sound dramatic). All I can say, is that the speculation is killing me! What I didn’t tell you about my experience with the iPad 2, was that I was seriously contemplating robbing the friend who let me rock it. As I walked around Miami, recording video and talking with various admirers inquiring as to what I was doing (walking around holding a tablet in front of me), I thought about the various stories I could come up with as to why I was returning without the device. But, I suspect, if I had made off with the iPad 2, the iPad 3 would drop immediately thereafter, and I’d be stymied, once again, in my efforts to possess the latest and greatest Apple device. So, I wait, until March 7th, when Apple will allegedly announce when the iPad 3 will be available for sale. And I will wait (not in some line outside the Apple store like some teenage concert-goer) until I can cop one for me-self. Shoot, it’s about to be my 42nd birthday in two months. But really, enough with the leaks. Drop the iPad 3 already! !